River Valley senior Madison Tabor (19) spikes a ball past Alexander’s Jenna Houpt (7) during the Lady Raiders’ regular season finale on Thursday in Bidwell, Ohio. 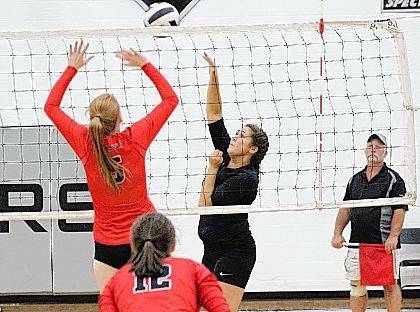 BIDWELL, Ohio — The Lady Raiders just hit a small speed bump on their way to the postseason. 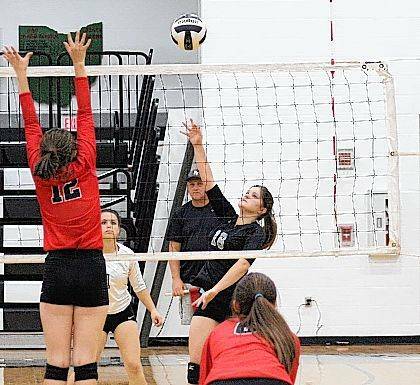 After back-to-back victories, the River Valley volleyball team lost a bit of its momentum in the regular season finale on Thursday in Gallia County, as visiting Alexander claimed a straight games win in Tri-Valley Conference Ohio Division play. 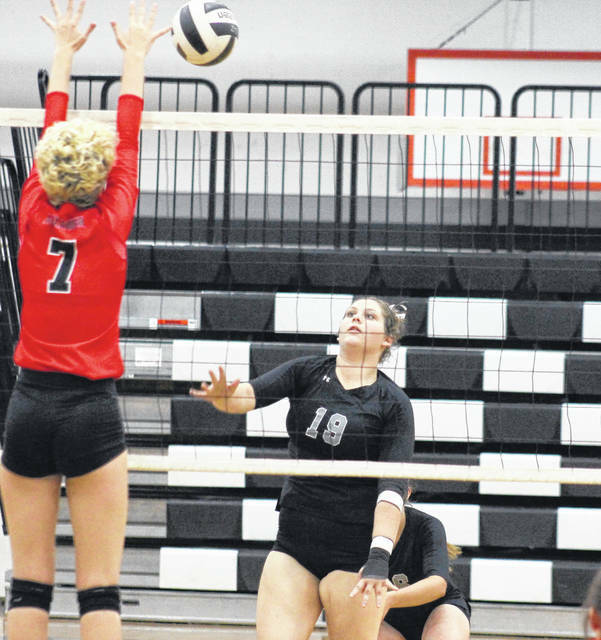 The Lady Raiders (5-17, 1-11 TVC Ohio) scored the opening point of the night, but Alexander took the advantage at 2-1 and never trailed again, winning the first game by a 25-14 tally. The Lady Spartans led wire-to-wire in the second game, boasting their best side-out percentage of the night, at 77.8 percent, en route to the 25-9 victory. The Lady Raiders finished the night with their best effort of the match, earning nine service points on 17 serves in Game 3. 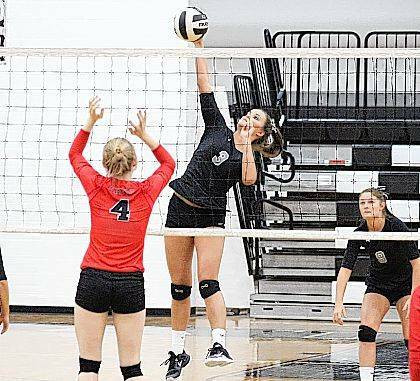 Still, the Silver and Black never led in the finale, as AHS prevailed with by a 25-17 count, capping off the sweep. “They hustled all the way though to their last game and their coach is proud of them,” River Valley head coach Brent Smith said of his team. For the game, River Valley recorded 18 service points, while Alexander recorded 52. The Lady Spartans held a 56.1-to-28.8 advantage in side-out percentage for the match. The Lady Raiders finished with six aces outs of the 42 serves in play, while marking 11 kills out of 57 accurate attacks. Six of River Valley’s kills were assisted on. As a team, the Silver and Black came up with 20 digs. Alexander also defeated the Silver and Black on Sept. 19 in straight games at ‘The Alley’. The Lady Raiders — seeded 8th in the Division II district bracket — will visit top-seeded Unioto in the sectional semifinal on Wednesday in Chillicothe.